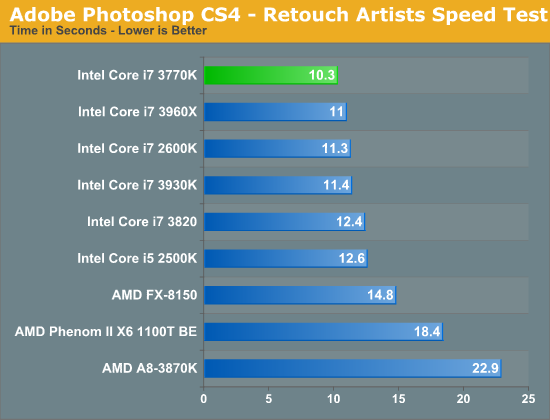 To measure performance under Photoshop CS4 we turn to the Retouch Artists’ Speed Test. The test does basic photo editing; there are a couple of color space conversions, many layer creations, color curve adjustment, image and canvas size adjustment, unsharp mask, and finally a gaussian blur performed on the entire image. The whole process is timed and thanks to the use of Intel's X25-M SSD as our test bed hard drive, performance is far more predictable than back when we used to test on mechanical disks. Time is reported in seconds and the lower numbers mean better performance. 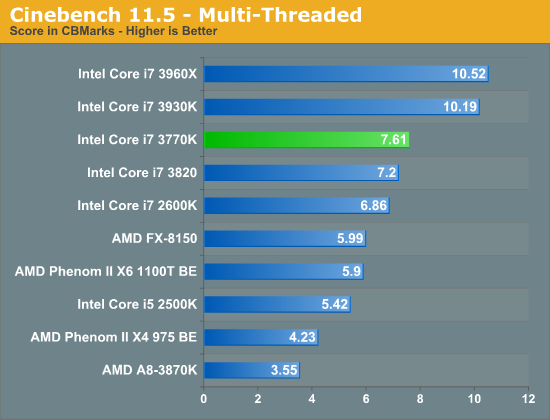 The test is multithreaded and can hit all four cores in a quad-core machine. Our Photoshop test is well threaded but it doesn't peg all cores constantly. Instead you get burstier behavior. With the core count advantage out of the way, SNB-E steps aside and allows the 3770K to step up as the fastest CPU we've tested here. The performance advantage over the 2600K is around 9%. Today's desktop processors are more than fast enough to do professional level 3D rendering at home. 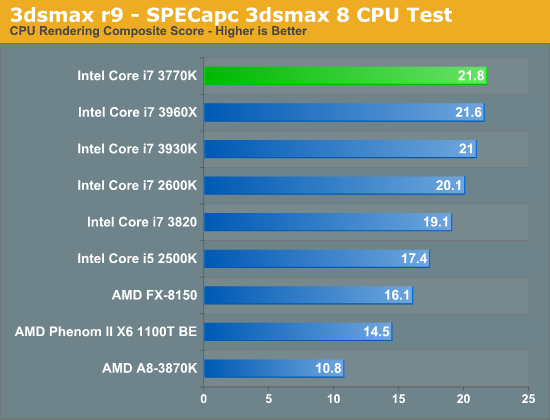 To look at performance under 3dsmax we ran the SPECapc 3dsmax 8 benchmark (only the CPU rendering tests) under 3dsmax 9 SP1. The results reported are the rendering composite scores. 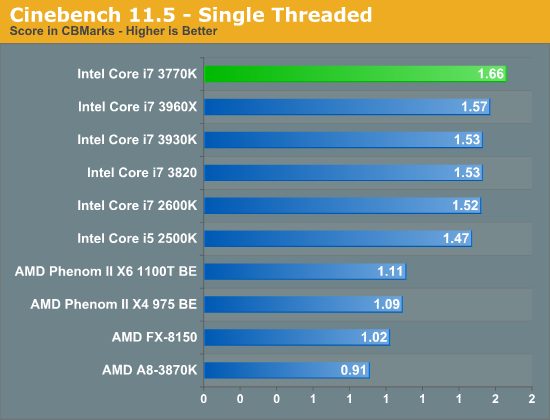 In another FP heavy workload we see a pretty reasonable gain for Ivy Bridge: 8.5% over a 2600K. This isn't enough to make you want to abandon your Sandy Bridge, but it's a good step forward for a tick. Created by the Cinema 4D folks we have Cinebench, a popular 3D rendering benchmark that gives us both single and multi-threaded 3D rendering results. If you're running a workload that can really stress multiple cores, the 6-core Sandy Bridge E parts will remain unstoppable but in the quad-core world, Ivy Bridge leads the pack.